Can Democracy and Islam Coexist? The Muslim Brotherhood has recently been elected with Mohamed Morsi as it’s leader — a strict Islamist. 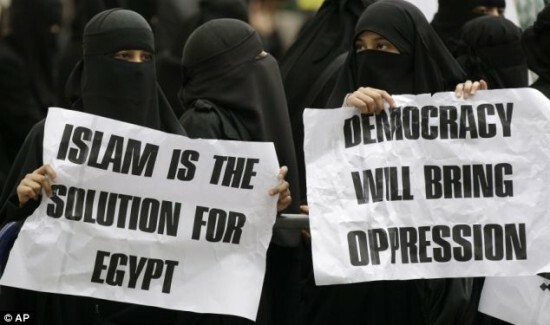 In a recent discussion I’ve had with another blogger, musingsaudi,on a post she made Are We Just Not ‘Democratizable’?, I questioned whether a strict interpretation of Islam is possible in a democracy. To be honest, I don’t think it can, but I am open to other opinions about how this could be so. Problems exist in Sharia that appear, to me at least, incompatible with the rule of law and sexual and religious equality, not to name many other critical institutions. Without these cornerstones, I can’t see how a democracy could flourish. With regards to the rule of law, is it possible that Sharia can be looked to as a guide for the legal system? Can problems like adultery and apostasy be punishable by death in a democratic society? Do most Muslim agree with this? And if they don’t, then democratically speaking, these laws must run counter to Sharia. Regarding sexual and religious equality, it isn’t difficult to see where numerous problems will exist. If women and non-Muslims are not treated on a par with men, then the majority of the population will be discriminated against. Again, a big problem in a democracy. As to the question of whether Middle Eastern countries can become democracies, I answer with a strong “Yes”. However, my guess is that an Islamic Reformation of some sort would be required to accomplish this. Only with a tempered interpretation of Islam could a true democracy exist. As an update, I disappointingly found an article with the exact same title as mine, which discusses the title’s question in terms of cultural imperialism. 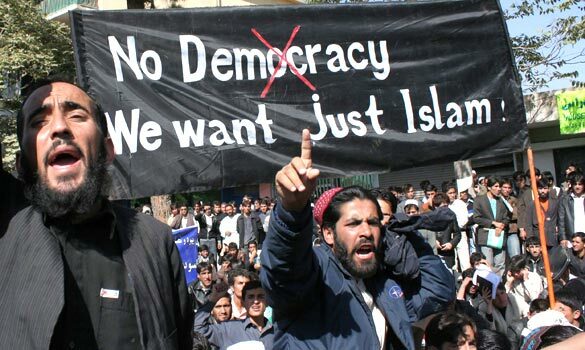 That is, the term democracy is something the West is thrusting upon Islamic countries with rules decided by the West. This is an assertion that I am wholeheartedly against for a couple reasons. First, it merely heightens the West-East dichotomy that fuels anti-West rhetoric. Democracy is not the West’s attempt to destroy Islam, it’s a political system that is not supposed to be affected by religion. Second, the author is implying that democracy for Muslims must be modified in order to fit with Islam, not the other way around (that Islam must be modified to fit with democracy). There have been many attempts at democracy throughout history. The most successful ones, like America’s, instituted checks to prevent the perversion of democracy by religion or other dogmas. This is my whole point: a strict interpretation of Islam (or any religion for that matter) will, over time, erode the “democracy” in that country. Democracy is not the way of forward, since it gives no right to women like they deserve to be given. It treats them like waste. But it is only through morality and justice as in Islam that one can expect women to be treated like Queens. This article proves that Muslims are sick and tired of people like you trying to FORCE democracy on us! We DONT want your democracy. Thank you. We would be much happier without it. Did I force democracy on Egypt or Pakistan or Turkey? Do you speak for all the Muslims in those countries? Then why do the majority of citizens in those countries support democracy? Checkmate. If an elected government via democracy comes up in egypt and gets overthrown in less than a year by an army officer in egypt, and in doing so causes the deaths of hundreds of innocent children and women then why is it that you people (the so-called liberals) suddenly start supporting the army officer like what happened in egypt recently?? Who said I support a military dictatorship? I don’t. Double-checkmate (you lose two times!!). Then that means you should support the Muslim Brotherhood, since they had every right to authority and since many in Egypt still support them as their rightful rulers. No, I support neither. The world is not black and white as you believe. Clearly then you have taken the side of the oppressor. Why? Because, when you remain silent in moments of oppression you have in effect, taken the side of the oppressor.